Samsung all set to reveal its new creation, Galaxy S9 on Feb 25! Samsung is in the process of launching its next big phone, Galaxy S9 by the end of Feb month. The company has officially announced its new formation release date to be 25th February 2018 while the masterpiece will be displayed at Mobile World Congress (MWC) in Barcelona on 26th Feb 2018. 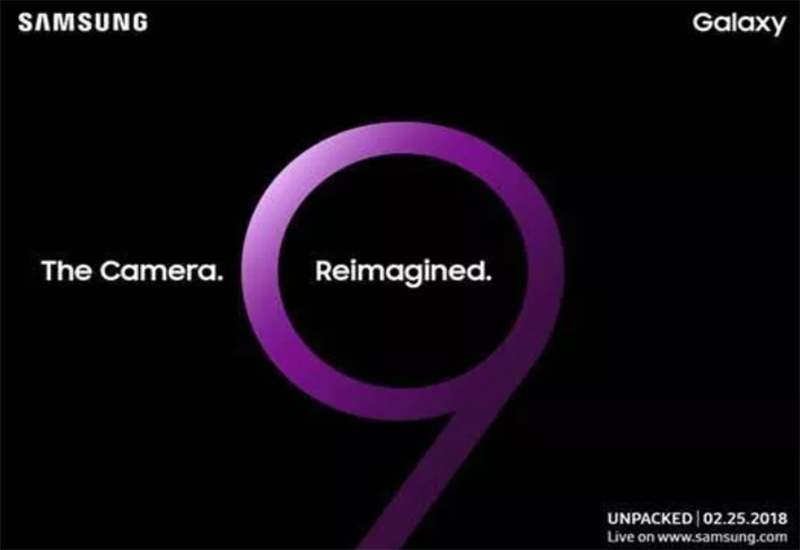 Galaxy S9 seems to be all about the redefined camera, as Samsung on their invitation has included a gigantic purple “9” on a black background quoting the words, “The camera. Reimagined”. Although the invitation letter does not reveal much about the phone it does justify the rumors of improved camera performance. While Galaxy S9 is going to give a tuff competition for iPhone X and 8 plus, MWC is said to run from 26th Feb- 1st March 2018. MWC is the largest mobile exhibition show where all mobile brands get an opportunity to showcase their new collection of the mobile device for 2018. And Samsung undoubtedly has the longest history of introducing galaxy device at MWC every year. However, on 12th Jan 2018, a retail box of Galaxy S9 got leaked where all the configuration and features of Samsung’s upcoming masterwork got disclosed. The sudden outburst had somewhat pacified the guessing game of consumers as the new phone offered 5.8” inch full rectangle screen with 8MP AF Selfie Camera, 12 MP SuperSpeed Dual Pixel with OIS, a wireless charging support, an Iris scanner, AKG tuned earphones, 4GB RAM and 64 GB internal memory and IP68 Water and Dust Resistant.